The graceful styling and high-tech engineering of a horizontal opening Aluminium framed Casement window, complete with window jamb, or a hinged on the top, Awning window, that tilts out to allow for ventilation, even during bad weather. Only BlokUp has taken Glass Bricks one step further than a mere fixed section of wall to create an opening Glass Block Window. Utilizing thinner, lighter "wafer" Glass Bricks to provide light, privacy, better thermal performance and excellent cross ventiliation. Unlike acrylic bricks, true Glass Bricks do not lose there clarity over time. 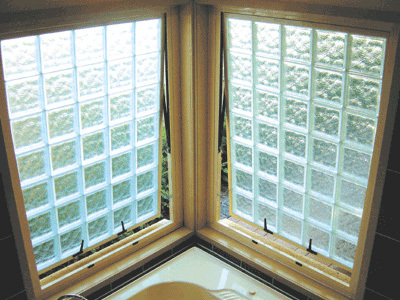 These windows are prefabricated in powder coated aluminium frames complete with window frame, window jamb and hardware. The innovation of Glass Block windows is that patterns, and colours can be incorporated along with increased privacy offered by Hollow Glass Blocks and the strength of the hollow blocks over single pane alternatives.